Art of Pens: Montblanc Meisterstuck "Mini Mozart"
Let me start by saying: this pen is not mine. I wish it was, but it's not. I saw it, dusty and dirty, sitting very innocuously in my boss's penholder about a month or so ago and I was naturally fascinated. I started hunting around online for the identity of this very elusive, tiny little burgundy pen, which I knew of course to be a Montblanc given the iconic white star emblazoned on the top of the cap (see picture below). After several googling sessions, I stumbled upon this fountain pen network thread. From there I knew exactly what pen my boss had; the "Meisterstück Hommage À W.A. Mozart Fountain Pen (Small Size)" (see the official Montblanc page here), quite a mouth full, so I'll just refer to it simply as the "Mini Mozart". 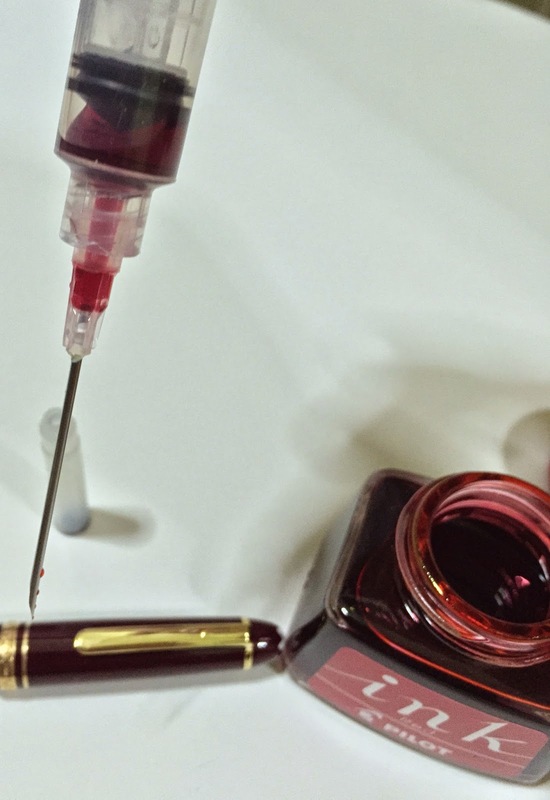 When I had happened to be in my boss's room again, I brought up the topic of the little burgundy pen, and sheepishly asked: "can I have a look at it?". He laughed, knowing that I was a fountain pen enthusiast, and permitted me to do so. He then told me that the Mini Mozart had been given to him, many years ago, as a gift and that he had stopped using it because he just didn't have time to maintain it properly. I immediately offered to take the Mini Mozart home with me over the weekend to clean it and get it back to him in a good writing state. This is why I will be reviewing the Mini Mozart in today's post (though I had originally planned to do a write-up of the Onishi Seisakusho Celluloid Fountain Pen as part of my "Invaluable Pens" series of posts). Finish: Burgundy with Gold Finishes, the centre band on the cap is also nicely engraved with the words "Montblanc - Meisterstück" (see picture below). Measurements: The Mini Mozart is a very small pen; with a length of 10.7 cm (capped), 9.2 cm (uncapped and unposted) and 11.3 cm (posted). It has a barrel diameter of 0.9 cm (at its thickest point). Nib: The nib is 14 Karat gold and it is beautifully engraved (see picture above). Design: As you will you note in the previous two pictures above there are a 2 thin gold bands just before the nib and the end of the barrel. The rings have threads and allow the cap to screw on securely when the pen is either capped or posted. I love this feature of the Mini Mozart because it posts so securely; you won't feel the cap wobble as you write. This makes the pen feel as if you were writing with a single unit. This allows for the Mini Mozart to stay pocket-sized but writes and feels like a regular-sized pen (see picture below). I didn't manage to take pictures while I was actually cleaning the pen, but trust me when I say the pen was in a terrible state. There was dry ink encrusted on the nib, feed and in the barrel itself. The pen hadn't been used in such a long time that whatever little ink was left in the cartridge had turned into a gooey little blob which wouldn't budge no matter how hard you shook the cartridge. I washed the pen under cool running tap water, flushed the nib/feed with a syringe and then left the pen submerged in water for about 5 - 6 hours. 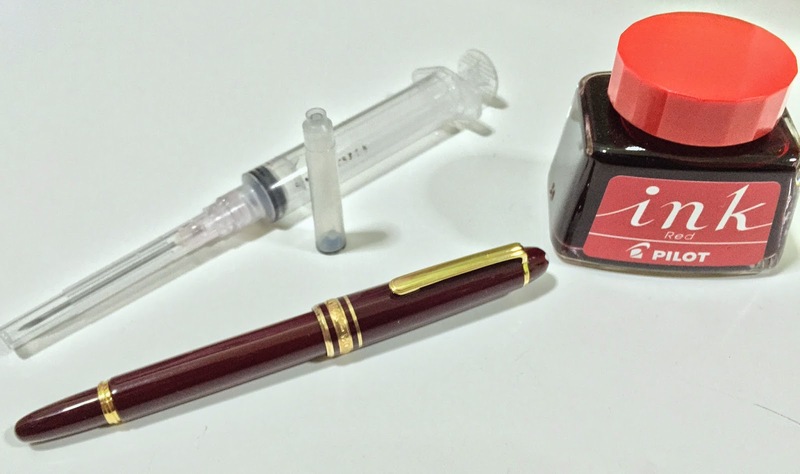 Even after the thorough flushing (with clear water coming out the nib), there was still hidden/encrusted ink dissolving into the water from the nib as it slowly soaked in the water. Because the Mini Mozart is so small, I didn't think it would take a converter (the official Montblanc page confirms this, see also picture above), so I used a needle and syringe to refill the same cartridge that was originally in the pen (see picture below). 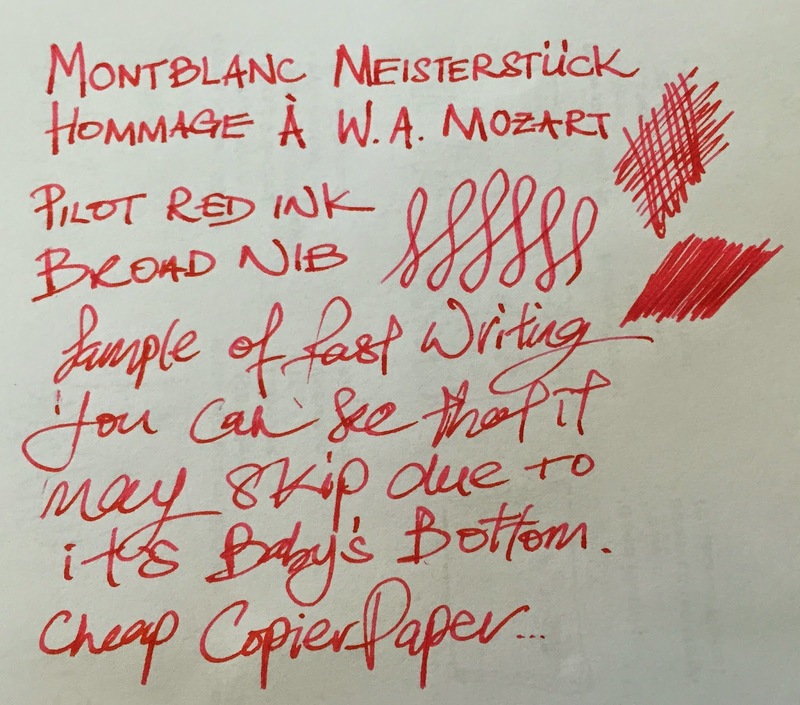 The Mini Mozart's broad nib lays down a very thick and "juicy" line (i.e. extremely wet, see writing sample above). The 14 Karat gold nib is soft and does allow for slight line variation with minimal strength. The nib also feels incredibly smooth on paper. Even on low-grade copier paper it feels fantastically smooth (when it can sometime feel like writing on sandpaper, especially with my cheaper fine-nibbed pens). However, that being said this particular Mini Mozart nib does suffer from a little bit of "baby's bottom" due to the over polishing of the nib, and therefore does have some occasional starting issues (see Richard Pen's glossary entry for baby's bottom). Though it is not too major an issue, it can still be a little frustrating at times. To be honest, this has to be, by far, the smoothest writing experience I have ever had. I simply love the way this pen writes and glides across the page. Overall, writing feels effortless with the Mini Mozart, and this is one of those pens that immediately and unconsciously improves the user's handwriting as the nib sails across the page. I personally don't believe in the mantra "the more expensive the better". From my few google searches online, I found a second-hand Mozart Mini going on ebay for about US$333 (about S$450, see here) and another ebay entry which states that the recommended retail price is about US$485 (about S$650, see here). Needless to say, this is not a cheap pen, and it is already considered the cheapest in the "140" series of Montblanc Meisterstück fountain pens. If you were to ask me: "is this pen worth the price? ", then I would say "no", unless I could easily afford it (i.e. if I was Bruce Wayne or Tony Stark). I say this because (a) it is plagued by minor starting issues (due to the "baby's bottom"), and (b) that would mean that at some later stage the nib will have to be reworked by a nibmeister and potentially cost the owner some out-of-pocket expense. As I have often mentioned, I prefer thicker and heftier pens and (c) the Mini Mozart is a tiny pen, which makes it an incongruous match for a "beefier" guy like me. Though I do admit that the Mini Mozart is beautiful, well-made with high quality materials, (d) I however still don't see the economic sense of purchasing this pen unless you are getting it at a greatly discounted price, or as a status symbol, or as a fantastic gesture of someone else's generosity. See also Inky Preacher's charming retelling of how he came to own and rediscover his own Mini Mozart here, which is testament to how easily a person can fall in love with a Mini Mozart and form sentimental bonds with a fountain pen, which far exceeds any monetary value attached to it. Having used the Mini Mozart for just a short period of time (over the weekend), it has become something of a "gateway drug" for me and I have proudly and defiantly declared to my wife that I will be getting my very own Montblanc pen sometime in the future, and I will be looking out for a good/mint condition second-hand MB with a decent price! For another very detailed review (with great pictures too!) of the Mini Mozart, see Hari317's FPN post here.